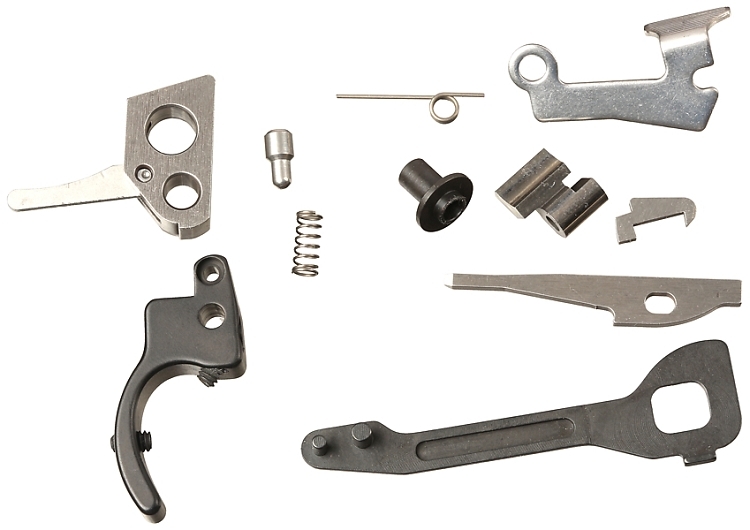 Complete drop-in kit for the Ruger MKIII and also MKIII 22/45 to provide a crisp, clean 2.25lb trigger pull (pull may vary slightly due to factory frame variances). The Competition Kit includes an extended bolt release (extended bolt release is not used when installing in a 22/45), target hammer and bushing, target sear, target trigger with over travel screw, return trigger plunger spring and polished plunger. No stoning required. Final trigger pull may vary slightly due to factory frame variances. In addition you get the bolt tune-up parts: The Exact Edge Extractor and our SureStrike Firing Pin. And to top everything off, you get a Volquartsen CNC machined disconnector. Finally removed that annoying magazine disconnect! Easier takedown, no more mag in mag out drill, great trigger! Magazines slide out with ease! The trigger still leaves a bit of pretravel, but is smooth as glass and resets very predictably and audibly. Kit is certainly not a simple install, but if you have patience, a steady hand and a good set of punches it’s not painfully difficult. It is a beautifully machined set of parts and fitment was flawless! Highly recommended for the handy trigger snob. This competition kit was the best thing you can possibly do to Ruger Mark 3 22 44 the pieces went in very easily they are all perfectly made in the trigger pull is excellent so much lighter and cleaner than the factory I can't imagine ever shooting the old factory Parts again. If you have a Ruger Mark 3 get one of these kids put it in today it will be the best thing you ever did for your gun. I installed this kit in my 22/45. Took it to the range fire several rounds and got the reset screw and the over travel screw set. I fired a simulated 20 second timed fire and pulled off a 97-1x. I'm impressed. we weighed the trigger in at 2.25 pounds. did this several times and got the same readings. Very well built. Hats off to Volquartsen. I've installed this kit in a couple of my Ruger Mark series pistols, and they are fantastic. After a couple of my friends have shot my pistols with this kit, they've ordered one for their pistols too. Amazing trigger pull with this kit, and the other parts smooth the action and increase the reliability of the pistol. HIGHLY RECOMMENDED! It takes a little patience and time to install, but it isn't difficult. I installed this on a ruger MK III 22/45. Everything went together well and by installing the MK II kit on my MK III I was able to eliminate the magazine disconnect safety. The firearm is still safe it just no longer requires a magazine to be in place to operate the trigger or perform any other function. The adjustments on the trigger took a minute to get just right but the adjustable trigger makes a huge difference. If there is any questions about install You Tube has several videos with detailed step by step directions. Excellent quality ! Great price and fast shipping to boot !